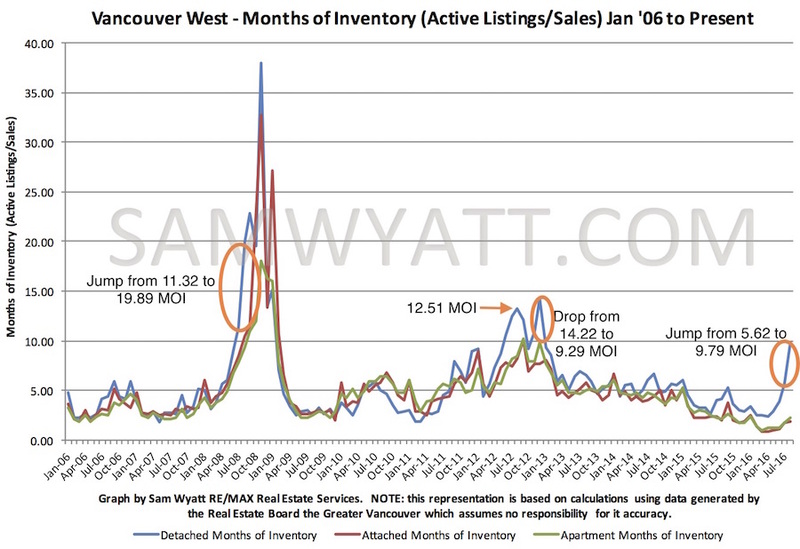 Months of Inventory (MOI) shot up from 5.62 to 9.79 months between July and August 2016 for Vancouver West houses; pushing MOI for houses just inside "Buyer's market" territory. MOI had already been creeping steadily up for houses since March but the last time we saw MOI rise more than 5 months over a single month was between October and November 2008 when it jumped from 19.5 to 37.96 months (and July and August 2008 from 11.32 to 19.89) as the credit crisis was unfolding. MOI has not been this high for houses since late 2012 when it was up to over 14 months. In sharp contrast, attached homes and apartments both continue to hover just under and over 2 months respectively - historically super low figures. Decreased sales lie squarely at the root of the sudden increase in MOI for detached homes. Sales volumes for apartments and attached homes remained robust, hence their continuing low MOI. 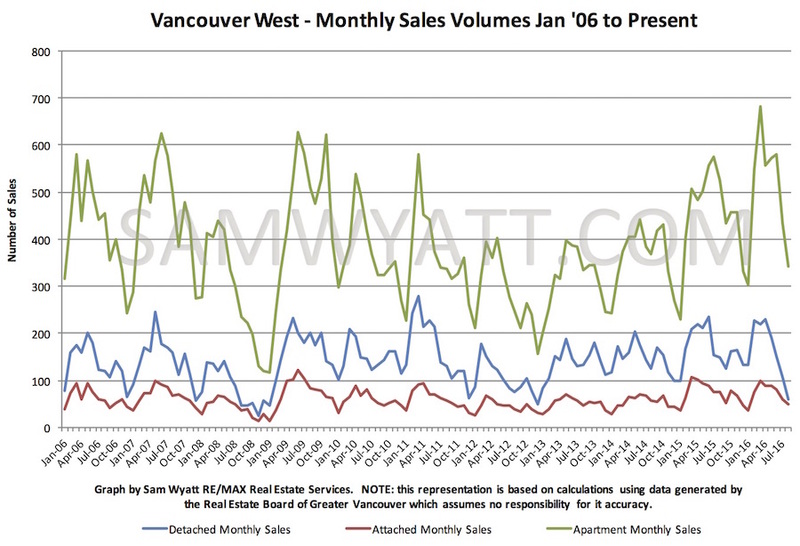 Sales volumes have generally been falling since the super-hot month of March but the fall to only 61 house sales on the west side of Vancouver is the lowest monthly sales volume since December 2012. We need to go all the way back to 2008 to find an August with fewer sales. The effect on pricing thus far has been negligible. In 2008 it took 7 months from the high point to the low point of the average sale price for west side houses. In 2012 it took 5 months. In 2008, the average sale prices fell about 30%. In 2012 it fell 25%. In both cases it rebounded quickly. The average sale price fell 9% between July and August 2016 and I estimate that we will see the average sale price for houses fall by a total of about 20% in the coming months. Recall that the average sale price rose more than 20% between December 2015 and July 2016 alone so this would put us back to where prices were in January 2016. The trouble for salivating bargain hunters is that one does not pay the average price for a home. 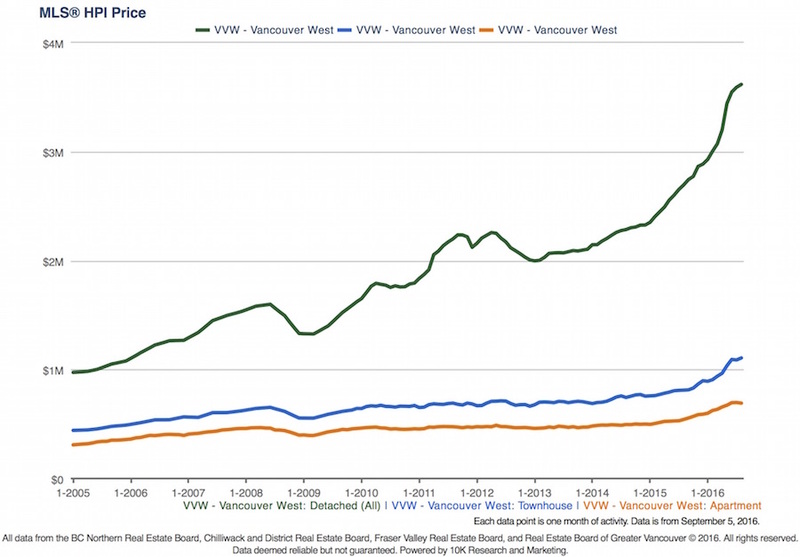 The Real Estate Board of Greater Vancouver's HPI Price is a better measure of price changes. 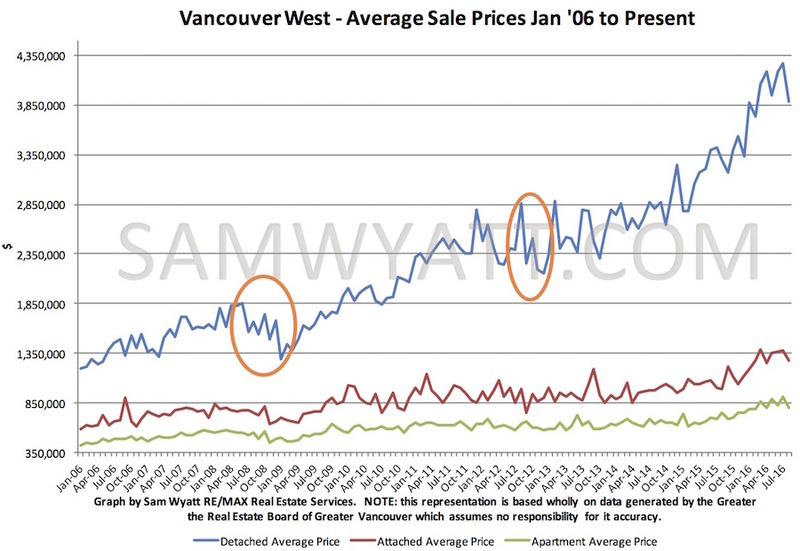 The average sale price for Vancouver's west side is influenced by a huge spectrum of price points ranging from below $2m into the tens of millions of dollars. Generally, the costliest homes see a greater decline when prices fall. The HPI index creates a "typical" home sale price which better reflects the changes for typical buyers and sellers. In 2008 the HPI Price decline from its high to low point was only 17% and in 2012 it was only 12%. Based on these numbers I suspect that the HPI Price for west side detached homes to fall by only about 10-15% in the next several months. For apartments and attached homes it is more likely that we will see prices flatten or fall only slightly. The big question is: why did house sales volumes fall so quickly? Sales volumes were falling from their high point in April each month until now but the biggest drop was in August. It is my opinion that the August announcement of the new 15% Property Transfer Tax for foreign entities made everyone say "let's just wait and see what happens". Because sales volumes have probably fallen based mostly on uncertainty around what is likely to be a nearly ineffectual tax tends to make me believe that we will see a similar rebound to 2009 and 2013. On the other hand, in 2008 and 2012 our market was given a helping hand by huge inputs of money into the global financial system via the US Federal Reserve's "quantitative easing" programs. It is highly improbable that such monetary stimulus will return in the short term. Last month I covered the Property Transfer Tax changes and I continue to expect foreign capital to flow to Vancouver come next spring as it has for some time now. In the meantime, those of you who are wanting to buy a detached home would be wise to be ready to do so sometime between November and January when I expect pricing to be at its annual low point. Those of you planning to sell houses should be gearing up to list in early Spring when MOI numbers have historically been most advantageous for selling.